Alec Bradley Cigar's annual St. Patrick's Day cigar is on its way to retailers. Called Black Market Filthy Hooligan Barber Pole, the limited-edition smoke is an offshoot of the company's Black Market line. 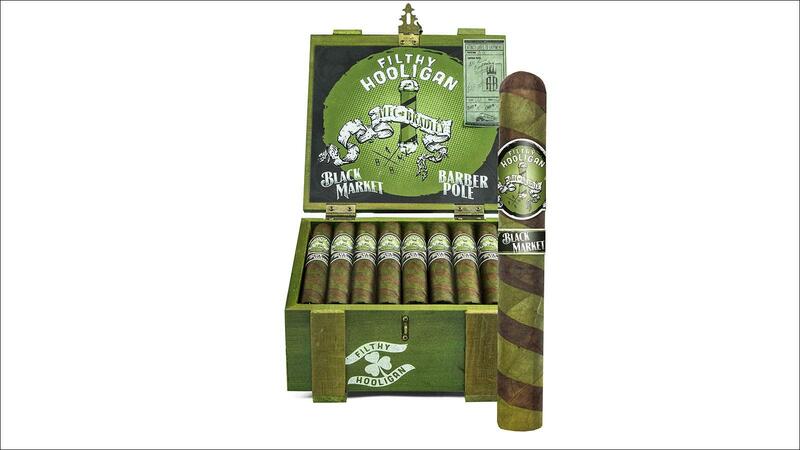 If the cigar looks and sounds familiar, that's because it is: This year's Filthy Hooligan has the same blend and vitola format as last year's version. Jonathan Lipson, director of sales and marketing for Alec Bradley, says this particular blend, draped in a dark, candy cane-style Nicaraguan wrapper interwoven with shamrock-colored Honduran candela leaf, was brought back by popular demand. "Last year's version was immensely popular. We kept receiving emails, lots of emails," Lipson said in a phone conversation with Cigar Aficionado. "Everyone wanted to know, ‘When's Filthy Hooligan coming out? Are you releasing it again this year?' "
Aside from the eye-catching wrapper combination, Black Market Filthy Hooligan Barber Pole also contains an Ecuadoran Sumatra binder and filler leaf from Panama and Honduras. Just like last year, the cigar is arriving at retailers in a single 6 inch by 50 ring gauge Toro format. The cigars are priced at $8.50 and ship in green-and-black striped boxes of 20. Alec Bradley Filthy Hooligan Barber Pole are rolled at the Plasencia's Tabacos de Oriente S.A. factory in Honduras.